During the Christmas break I went to Toulouse in the South of France. I have family there so I go two-three times a year. Excitingly, this year my vacation coincided with the 50th-anniversary of the Cinémathèque de Toulouse which was marked by the exhibition ”Du cinéma autrement – 50 ans de cinémathèque à Toulouse”. As the Cinémathèque’s building in Rue du Taur does not have an exhibition space large enough for hosting an exhibition of this scale, it had been installed at the Médiathèque José Cabanis, close to the Gare Matabiau, on three floors. The exhibition provided an insight into several of the core aspects of preservation and presentation in a cinémathèque with an emphasis on the collection building of one of its founding figures: Raymond Borde. Divided into ten sections the exhibition covered topics and collections as diverse as late-nineteenth century optical devices, the relationships between a cinémathèque, amateur collectors, directors and foreign institutions and their role in collection building, posters in different languages and the contribution of a regional cinémathèque in the creation of a local film culture. Below are some notes, impressions and photos. The Cinémathèque de Toulouse was founded in 1964 and is today the second largest cinemathèque in France. Apart from La Cinémathèque française it is the only French film heritage institution with the status of a national cinémathèque (yet, there are plenty of other smaller cinémathèques in France in Nice, Perpignan, Marseille, Brest and Lyon for example…). As most cinémathèques it branched out from a ciné-club or film society – in this case the Ciné-club de Toulouse – and its foundation is mostly associated with its leading film critic and historian Raymond Borde (1920-2002). Borde was in particular an authority on Soviet cinema and on film noir, subjects on which his studies remain groundbreaking still today. Especially the monograph Panorama du film noir américain. 1941-1953 (translated into English as A Panorama of American Film Noir. 1941-1953) which he co-wrote with film critic Etienne Chaumeton is a defining film noir genre study. Borde was also a fervent surrealist belonging to the circle of André Breton and a communist who wrote sulphurous critiques against practically any kind of bourgeois institutions and conventions. In this respect, Borde’s pamphlet from 1964 – L’extricable – had wide repercussions both in surrealist circles and in French mainstream culture. It was enthiusiastically acclaimed by Breton and Luis Buñuel and provided great inspiration for Georges Brassens whose enthusiasm for the pamphlet made him buy around fifty copies which he would hand out to good friends with dedications. Written in a deliberately cruel, aggressive and anarchist tone L’extricable contains ridiculing of anything from family structures, academic culture and consumerism. The scholarly part of Borde’s literary output is more low-key and rigorous compared to his surrealist writings. Yet, there remains a distinct directness to his style which reflects his ideological and political concerns. In general, Borde was not a person to filter his opinions. Ironically, this would cause a backlash when as a consequence of 1968’s ‘Langlois affair’ he was excluded from surrealist circles because he went against Henri Langlois, La Cinémathèque française’s director, when the French ministry of culture, then headed by André Malraux, wished film critic Pierre Barbin to replace Langlois. For the field of film preservation, Borde’s importance as a writer and historiographer has also been immense. His monograph Les Cinémathèques (L’age d’homme, 1984) arguably remains the most thoroughly researched and comprehensive historical account of the film preservation movement’s emergence from 1920s cinephile culture, its institional antecedents in scientific film archiving and the transformation of cinémathèques into state-subsidized institutions (in Europe at least) which created stronger ties to for example UNESCO to promote their mission of preservation. With such a status and rich legacy the Cinémathèque de Toulouse certainly has something to celebrate with its 50 years anniversary and a good reason for creating an exhibition to mark the event. Not surprisingly, the role of Borde in the institution’s history was highlighted by showing how the different facets of his interests and activities have shaped the collection building of La Cinémathèque de Toulouse to this very day. The cinémathèque for instance has an exceptional collection of Soviet cinema, arguably the most important outside of Russia. As the current director Natacha Laurent – herself a great authority on Soviet cinema, author of a monograph on film censorship under Stalin L’oeil du Kremlin. Cinéma et censure en URSS sous Staline (Privat, 2000) – explains in the accompanying booklet which accompanies the exhibition, Borde and the Cinémathèque de Toulouse developed exceptionally strong ties to the Gosfilmofond and the Cinemateca de Cuba which its film and poster collections benefited immensely from. 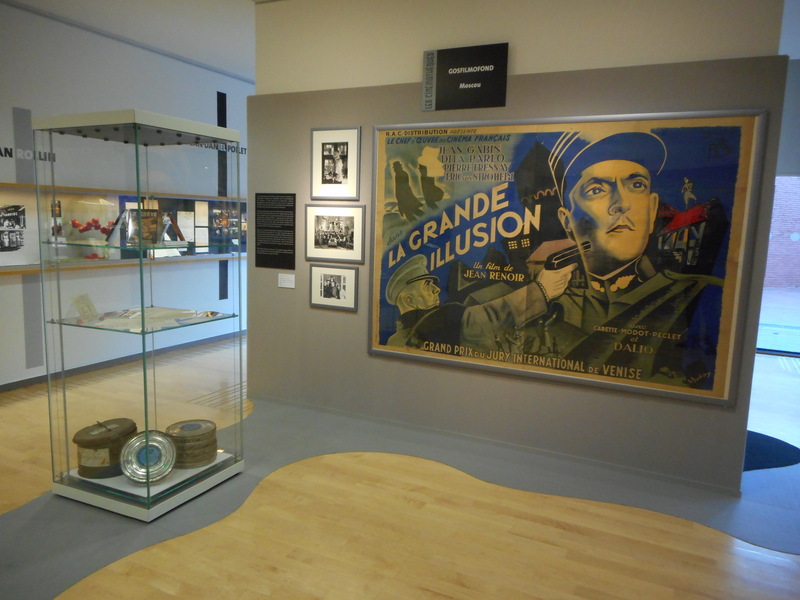 It was also via its connection to the Gosfilmofond that the Cinémathèque de Toulouse managed to repratriate the camera negative of Jean Renoir’s La grande illusion (France, 1937), which, according to legend, the Russians had taken with them from Germany immediately after the second world war. As the photos below testify to the cinémathèque’s collection is however far from limited to its rich collection of Soviet cinema. Poster for Jean Renoir’s La grande illusion (France, 1937). The blurb to the left of the poster explains that the Gosfilmofond decided to give back the film’s original negative in the mid-1970s some 30 years after the Red Army – at least that is how the story goes – had brought the elements with them from Berlin as a war trophy. 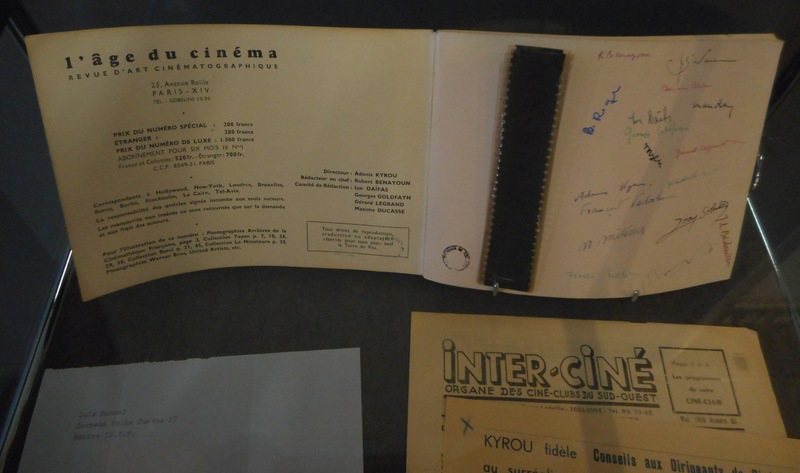 In the display case are exhibited cans from the Gosfilmofond as well as correspondences with Raymond Borde. It can be read in these letters that Borde would for example give copies of the film journal Positif, which he was involved in for many years, in exchange of elements from the Gosfilmofond. As a surrealist collector who did not distinguish between high and low culture – an approach which is arguably in the very DNA of cinephilia – it is perhaps not surprising that Raymond Borde showed a great interest in the work of Jean Rollin, prominent French director of vampire sleaze (very often referred to simply – and somewhat unjustly – as the ‘French Jess Franco’). 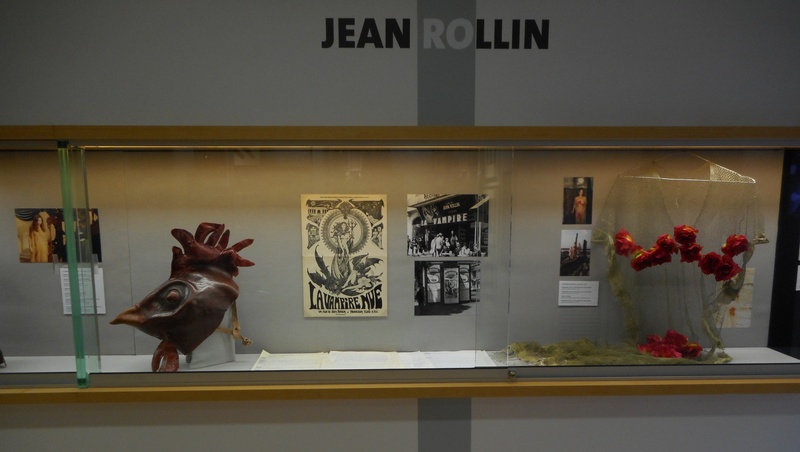 Next to the section on La grande illusion and the Gosfilmofond a display case with props and film related material from Rollin’s La vampire nue (France, 1970) had been installed. 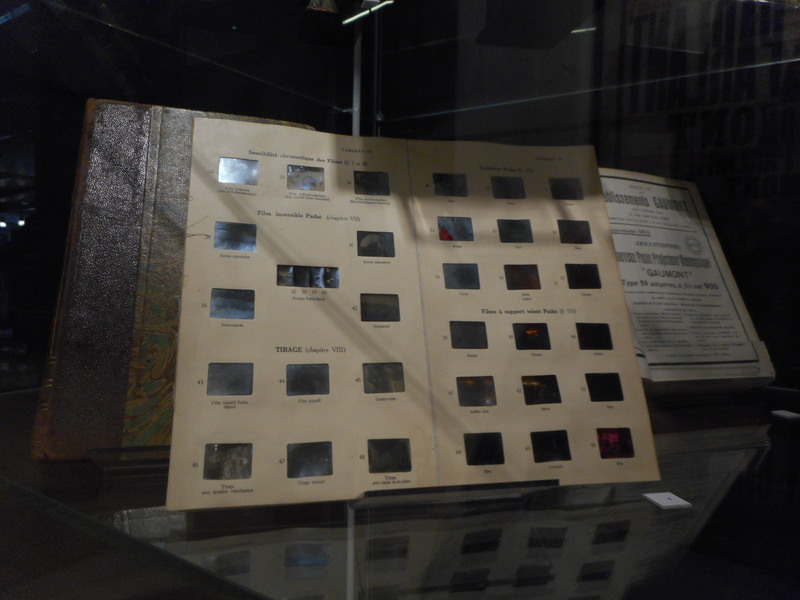 The section ‘Aux origines du cinéma’ displayed objects from different periods of silent cinema and optical devices dating from the period prior to cinema’s emergence. Below a manual for film tinting and toning (I believe from the mid-1920s and probably a Pathé manual but I did not write it down). One of the most urgent tasks facing film heritage institutions in an era of transition toward digitisation is to convey the materiality of analogue film. The exhibition had gone for a very simple, pedagogical but also effective solution. 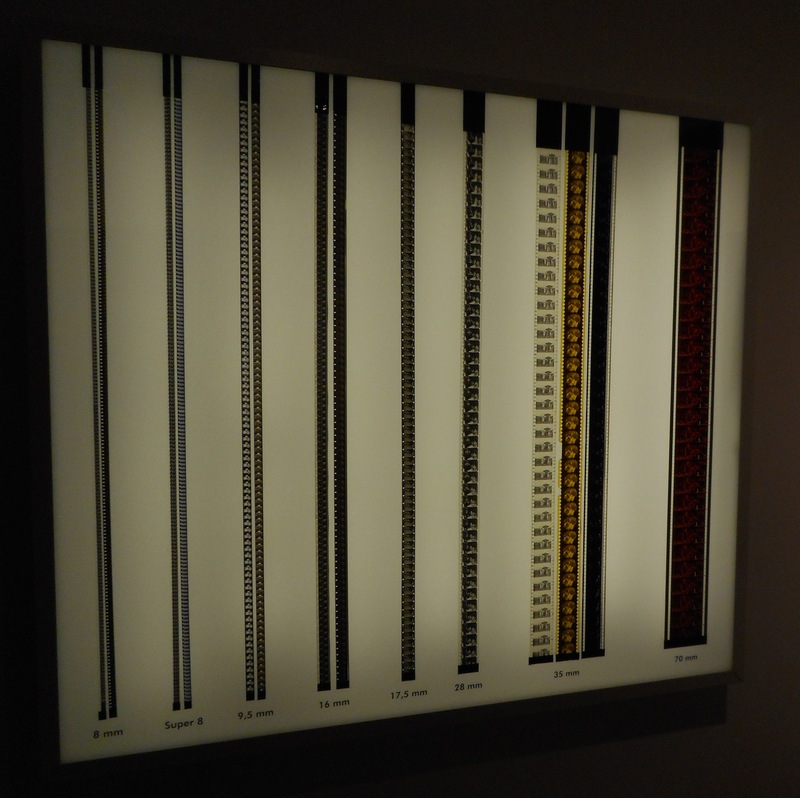 Snippets of film in different formats from 8mm to 70mm had been mounted on a lightboard and could be touched and examined with magnifying glasses hanging next to it. A special, limited edition copy of the surrealist film journal L’âge du cinéma published under the direction of film critic and director Ado Kyrou. Six issues appeared in 1951-1952 focusing on avant-garde and experimental cinema. The signatures on the right page include among others Man Ray, André Breton, Jean-Louis Bédouin and Jindrich Heisler who contributed to the issue. 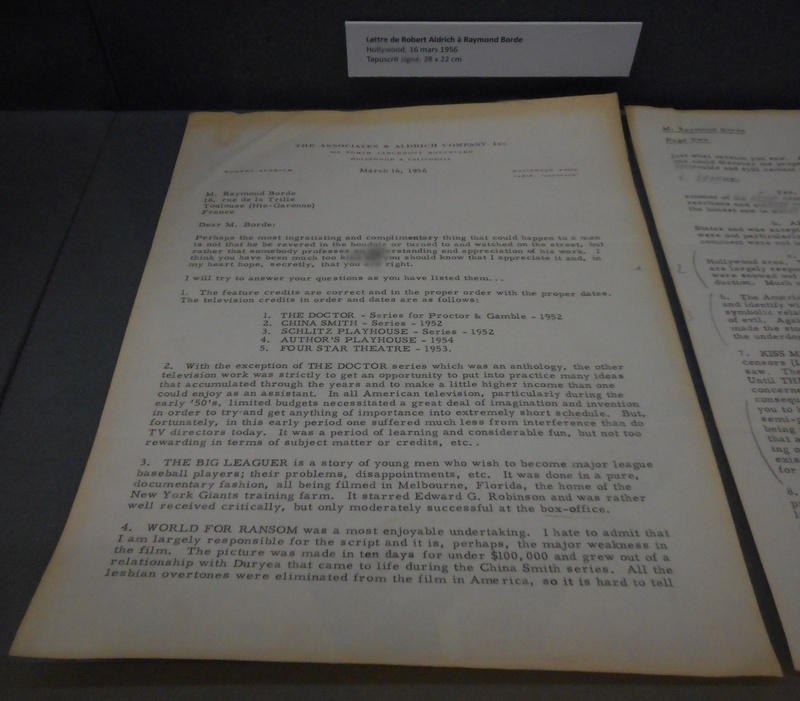 Letter from Robert Aldrich to Raymond Borde from 1956 in response to Borde’s questions on Aldrich’s television works from 1952-1954. 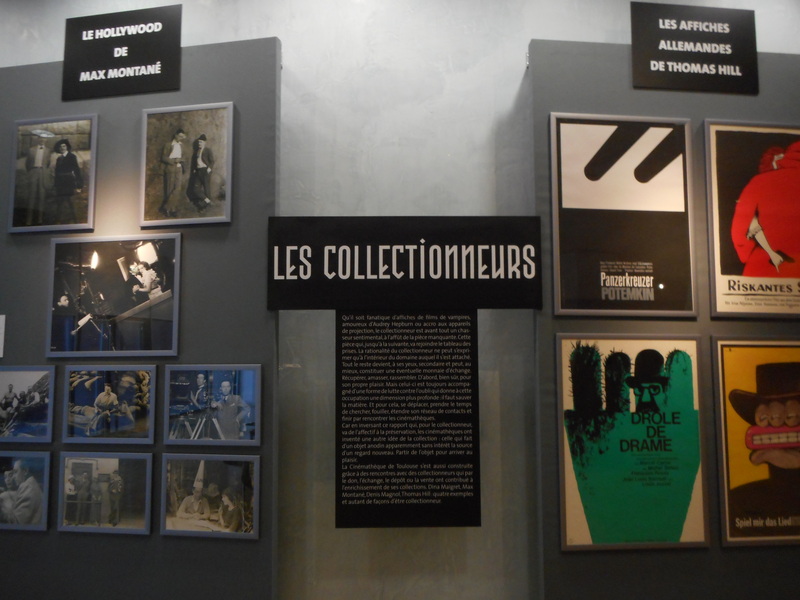 The exhibition also included a section on the relationship between amateur collectors and the cinémathèque. For the Cinémathèque de Toulouse the extensive stills and poster collection would not have been quite the same without the indefatigable work of collectors such as Max Montané and Thomas Hill. Max Montané for instance build up a considerable collection of Hollywood still photographs of which he received a large part from Robert Florey. Often the relationships between cinémathèques and collectors are not widely discussed or transparent and yet cinémathèques have traditionally relied heavily on the idiosyncratic collection building of passionate individuals to enrich their own collections. This is what the facade of La Cinémathèque de Toulouse’s building in Rue du Taur 69 looks like. 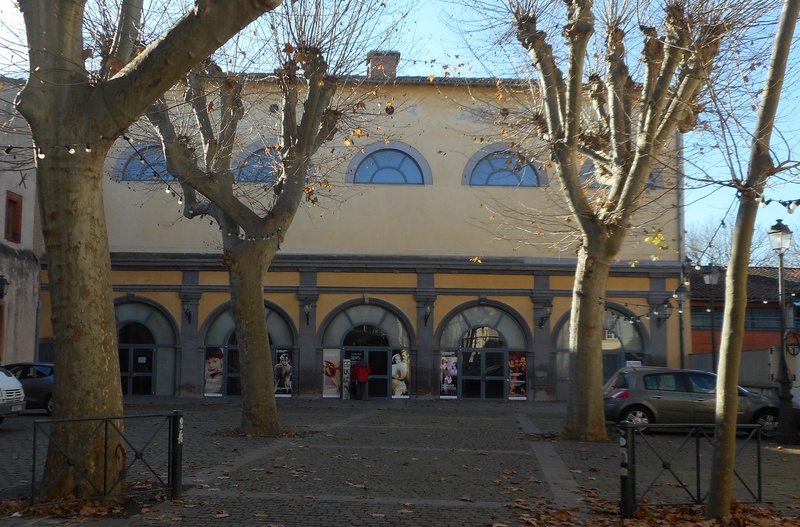 Once the home of Ciné Espoir which had close ties to the Spanish socialist movement that gained a strong foothold in Toulouse after the Spanish civil war, the Cinémathèque’s cinemas and research library are now located in this building. In the summer months the court yard is used for the annual open air screening series ‘Cinéma en plein air’. Below is an image of the new film and DVD shop of the bookstore Ombres blanches (not a part of the Cinémathèque, but I had to post it here). 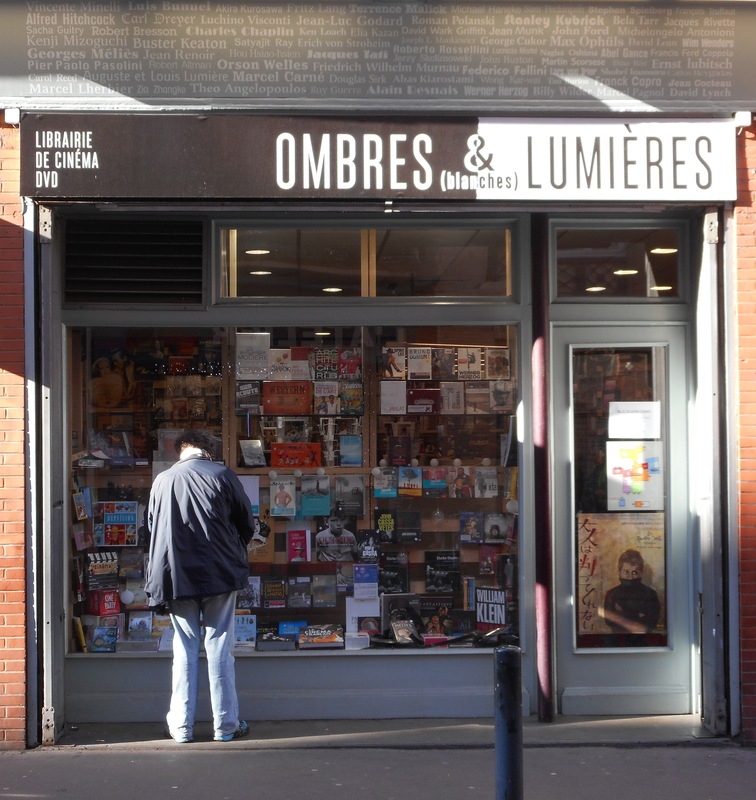 Ombres blanches is a legendary bookstore in Toulouse founded in 1975. It has always been renowned for its extremely wide assortment and specialized staff who know exactly what they are talking about when they give advice. In the past five-six years Ombres blanches has kept growing and especially its cinema section has become more and more developed. Going to Toulouse at a 4-5 months interval I have been able to follow this first-hand and see how the book and DVD sections only expanded and got more specialized. This development has now culminated in the opening of an entire bookstore devoted only to cinema at a separate location (just in front of the old shop in Rue Gambetta) named Ombres & Lumières: shadows and lights. Below a frieze containing a list of classic auteurs one enters a haven of film books both classic and new. This is quite incredible in a time when specialized bookstores are often regarded as belonging to a bygone era. A must for the cinephile visitor! This entry was posted in Film Heritage, Film History, French Avant-Garde, Gosfilmofond, La Cinémathèque de Toulouse, La Grande Illusion, Raymond Borde by Christian Gosvig Olesen. Bookmark the permalink.